Is SeeSaw too late to the online party? Why don't we have Hulu? That's the most frequent question asked when discussing the state of video on demand in the UK. Well, now we now do. Kind of. SeeSaw launches today, marking the first time we have a (legal) place to watch myriad content from terrestrial channels in one online portal, without the need to switch from online video player to online video player and back again to get your programme fix. Built from the rubble that was Project Kangaroo, SeeSaw has had something of a tumultuous upbringing – one which echoes the problems VoD-casters face when entering the UK market. To begin with Project Kangaroo was meant to be our Hulu – a place where all content that's piped through an aerial finds itself eventually online. Where we control the time and the place to watch the next episode of Spooks et al and then flick over to an ITV show without changing web pages. This didn't happen. The Competition Commission put its boot into Arqiva's plans – the folks behind the project – fearing that this one-place-for-all approach would stifle the reach of the smaller players in the VoD market. So, SeeSaw was born, ITV content was shed and Channel Five came on board. 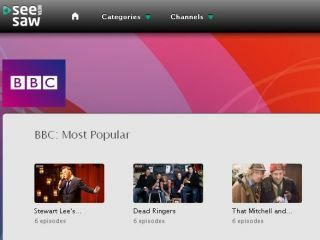 Flick to the channel section on SeeSaw and it looks rather lonely, with just the BBC, Five and 4oD listed. And the kicker is that 4oD is merely a re-skin of the 40D channel. But at least it doesn't send you over to the 4oD website. At least CEO SeeSaw Pierre-Jean Sebert is upbeat about the service, explaining: "We estimate that there are two and half million people in the UK regularly watching TV via video on demand services such as the BBC iPlayer. "We are initially targeting this group via an online advertising campaign and then moving our marketing efforts onto TV in order to capture the 13 million people who have used both linear and web TV services – but are still more reliant upon the big screen." This 'more reliance on the big screen' is a loaded phrase which masks a slight pop at the other VoD contender soon to hit the marker – Project Canvas. The big key to SeeSaw, when looked at in relation to Project Canvas, is as follows: SeeSaw is aimed at those watching VoD content on a computer, Project Canvas is aimed at those who want it on their big-screen TV. In industry speak, the difference is SeeSaw is seen as a 'lean forward' experience, Project Canvas - which is due to hit TVs by Chrismas 2010 - is a 'sit back' one. With PCs you interact more and TVs, well, they're Catnip for humans.